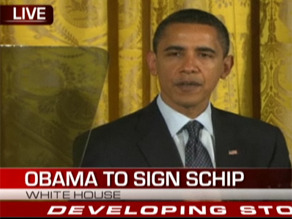 (CNN) - President Obama is holding a bill signing ceremony to expand the State Children's Health Insurance Program. Obama is backing up his campaign promises! I say more power to him! Jack Janski: It could still be Bush.... God ignored our cries for 8 years! We deserved what we got collectively whether we voted for him or not.... because more people should have come out to vote against him! Whatever Obama does it CANNOT hold a candle to the mess Bush and company has gotten us into! People like you are part of the problem... not the solution. Go back into your cave... or better yet... go back to your Limbaugh show... pffft... that appears to be your mentality! Make kids a prioirity and the Democrats will be in power forever. Even hard nosed Republicans will vote pro kids. I always thought that government healthcare would be a good thing when I was a democrat, but my eyes have been opened on a lot the government is doing. I can just see the government saying as some companies do if you smoke if you are overweight etc you are a risk and cannot be covered. Kids are more overweight now than ever becuase parents are too lazy to cook and either send the kids out to fast food or go as a family to burger king, mcdonalds etc. and they sit and play games all day after school so kids are becoming fat I know some of you will say no the government won't do that and that won't happen but I never thought wall street would be in the mess that it is now at least not in my life time, I never thought the government with the tax payers money would ever be shareholders in the banks, car industry and who knows what else is coming, I think this is a very highly probable senario. We shall see. The government is putting things out there slowly just enough to say yeah we need this and we we that and people are accepting it. Scarry. Wasteful spending, eh? I think you're completely wrong on this one. This country used to be about unification and a nation of one. Now we are divided about who gets to keep the money they don't use and helping people that have lost their jobs, because companies have been overrun by corruption. I think conservative groups need to take a long, hard look at the spending that has taken place over the last eight years and dare to call it useful. I'm afraid you'd be beaten in the streets for remaining selfish and moronic. Mr. President... stop courting the Republicans... they are the ones who got us into this mess with their agenda... we DO NOT need more of their stupid ideas! Do what you promised.. and let the Republicans feel what it is like! Be darned if I would give a care what they think! This is insane what a waste of money. I am sorry I am self employed and I budget to pay for my health over $500 a month with a $5000 deductible. We go without all the wants to have the needs. No vacations, no eating out, no movies etc...I am sorry to sound harsh but if you cannot afford the needs ie: health and dental then stop having the kids and start using birth control. Why should I pay for your lack of ability to budget. How can we pay for this. How can govt every run any program that actually works. Please China may we borrow more money that we will never be able to pay back? Thank You, hopefully we can at least pay you the interest due. Many of you think this is great! It is not and it going to continue to depopulated group programs where people were taking care of their individual family needs. Many people in this country have paid their premiums(me) I have 3 children and two grand children...I have struggled my entire life to take care of their needs and make sure they get the health care they need. This is the begining of the end...I am about ready to start a tax revolt. I love people, I love children.I do my best everyday to help all people. But this is insanity::::::::::::::::::::::::::and it is not going to work for long. People who live off of the goverment have children who grow up to live off the government. It is what they are taught. They don't grow up to be tax paying, responsible citizens usually. There are a few exceptions. Children learn by watching the adults in their life. Just thought I would post this in response to the person who said that we should pay for their health insurance so they can grow up to be tax paying, responsible citizens. By the way, no one wants children to suffer. Their should just be limits put on policies like this one. This should not include illegal immigrants and parents should stand up and take care of their own children or not have them in the first place! Barack wins and America collectively loses. Somebody gotta spend some money to test the water in Washington?? All these comical idea's are for some B movie script? The biggest problem is the speed they want to ram this down our throats?? Stand UP AMERICA, this is our last chance to SAVE this Country as we know it? Le'ts just SAY NO!!!!!!!!!!!!!! Aren't your great great grandchildren worth saving? I thought I had meet an intelligent Democrat once but I was wrong!! TEXAS TEACHER – you should really do your homework before you start pointing your crooked finger. It was actually the mortgage industry that started this mess. Guess who actually started the deregulation of the mortgage industry – – – BILL CLINTON!!! Then, when President Bush went to congress to ask for stricter regulations, your buddies Schumer, Dodd, and Franks (all dems) said that the mortgage industry wasn't broken HA! Then, McCain put a bill before congress to place more restrictions on ole Fannie and Freddie and guess what happened there – – – the dems voted no and the republicans voted yes. Unfortunately, the dems held the majority and ALAS! Here we are today in the mess that you dems keep blaming on the republicans. Amazing! And you call yourself a teacher? The right wing insists that any woman (or young girl) who becomes pregnant must have the baby whether she is can take care of it or not. The right wing does not want to help her (the father has already disappeared) access health care. Who suffers from this? The child, the parent, our healthcare system, ou educational system and the list goes on. The right wing can not pray or wish these children away – what are we to do? How about sending them to an island in Guantanamo Bay? To all those who think this a waste. Those who need this now more than ever, most likely had their insurance benefit lost, or their job disappeared and having no possible way to keep their kids healthy, this will help. Just remember BUSHCO helped bring this on. Offshoring the jobs, benefits gone..hours cut, the list goes on. The war BUSHCO brought on will cost even more than this ever will. Thank them!!! Another wasteful government program. The three things wrong with health care in this country today are health insurance, lawyers and government involvement . People used to go to the Dr when they were really ill or seriously injured. Then along came health insurance, and people started going to the Dr for every minor illness or minor injury. So you go to the Dr and seem to have a cold, but turns out to be you're the one in 10,000 people who had a more serious illness. So the lawyers came in and said the doc should have detected the more serious illness on your first visit and the doc gets sued for millions of dollars. Now everyone who presents with cold symptoms to this doc will get thousands and thousands of dollars worth of tests to be sure they really just have a cold. And the government decided they needed to have their hand in this health care business, so you have to spend $500 or more dollars to fill out all the government paperwork. Now a workup for what for 9,999 turns out to be a cold has cost on average $5000 each or about $50 million for these 10,000 people. So by all means let's get more government involvement, more health insurance and more ambulance chasing lawyers involved and see how more whacked out the health industry can become!